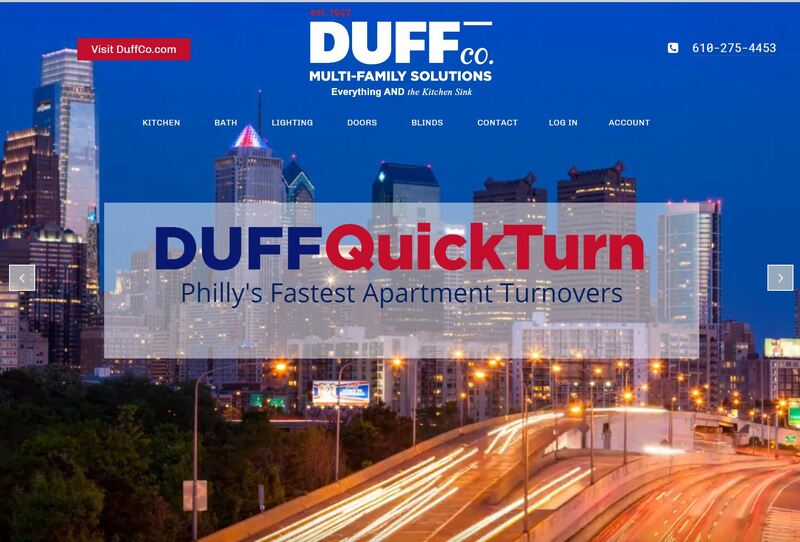 To make your apartment turnarounds as quick and easy as possible, login to duffmultifamily.com, where you can browse our products, put together your materials lists and purchase. Why wait? GO TO duffmultifamily.com RIGHT NOW! We have taken our one-source concept directly to multi-family housing managers and maintenance teams. Duff now offers a wide range of products and supplies for maintenance and renovation – including cabinets and countertops for apartments, dorms and much more. From janitorial supplies, light bulbs & electrical parts to light fixtures, mini blinds and ceiling fans, Duff is truly the one source for your supply and equipment needs in Philadelphia, Lancaster, Allentown, Doylestown and the surrounding areas. We offer several lines of quality kitchen cabinets and bath vanities for apartments and other multi family facilities. Our all-wood cabinets come in a variety of styles and finishes with a choice of countertop type and color. We even provide a design service to help you serve your customers and tenants better. This means Duff can provide everything you need for the kitchens, cabinets, plumbing and maintenance of your facilities. We offer a full line of kitchen cabinets and bathroom vanities to make your facilities in move-in, mint condition. With a wide variety of features, styles and finishes, our selection of cabinets is the best in the business. Plus, we offer personalized, custom design service to help you with even the most difficult kitchen layouts. Our cabinets are all-wood and made in the USA. Don’t forget the cabinet hardware. If you can imagine the finish, shape or style of a cabinet knob or drawer pull, chances are that we have it. We understand the multi-family housing market, and the urgency that’s often necessary–let us make your job easier: Call or email today! More than 67 years ago, our company started as a plumbing supply house. All these years later, it remains our core. But over time, we’ve developed an expertise in the commercial and multi-family market. Sure, you’ll need a new kitchen sink and faucet, the trap under the bathroom vanity and the copper fittings for the water lines. What you might not realize, however, is that we work around the clock searching for new products to make your job easier. For instance, ask us about the Penguin Toilet: the only toilet with built-in overflow protection. Think about it: For years, sinks and bath tubs have had overflow drains. Why not toilets? It will give you peace of mind–and could save you immeasurable hassle and headaches down the road. Vinyl, wood and faux wood; standard and custom sizes–whatever you need, we have it! Let us measure the blinds you need so that you can focus on your tenants. We make purchasing easy. Because we have the widest selection of products and deepest inventory — focused on maintenance and facilities teams at institutions and multi-family housing — you can order everything you need from just one supplier. Did you know that Duff specializes in bath accessories & hardware; door hinges, security and locksets; screening and accessories; and assorted other hardware? Call or email for a catalog today. There are countless electrical items that a facilities or maintenance staff will see in any given day. Luckily, Duff has you covered. For all those wall plates and accessories you need, and your tenants demand, we are your one-stop solution. Call us for smoke alarms and carbon monoxide detectors; electrical boxes, wall outlets and GFCI outlets; batteries; and all your tools and accessories. If you need it now, or if you don’t know how, call or email Duff! Most maintenance and facilities teams are charged with keeping things clean. This means you need cleaners and chemicals, paper products and assorted other janitorial supplies. When it comes to these types of products, we make your job easy. Our sales team knows what’s available, and the options that are best for you. Let us know what you need, and we’ll provide you the best products so you can do your job.